Crave Air heats up in about 30 seconds from room temperature and is ready to use. There are 3 temperature settings for Crave Air, which can be adjusted by using the power button. See user guide for more details. Will it work in all temperatures? Crave Air works in all normal climates. If you are living in humid or freezing climates please try to keep it warm and dry. Water from the air may penetrate to the internals if left in the elements too long. If you suspect water may have penetrated the device for any reason do not switch it on until you are sure it is dry again. Placing the vaporizer in a bowl of rice over night should help remove any moisture. We made cleaning the Crave Air as simple as possible.The silicon mouth piece can be washed with warm water if necessary. Internal cleaning can be done with alcohol wipes and pipe cleaners. Clean your Crave air as regularly as you can, generally a quick wipe with alcohol wipes for the oven will be enough. However it is best to give a full cleaning now and again to ensure optimum performance and taste. As the device gets hot during use, wait for it to cool down before cleaning. The oven screen on Crave Air is made from Stainless steel and designed to be long lasting. It will only need to be removed for cleaning the oven or the screen. We have provided you with a spare screen in case it gets lost. Firstly, if the herbs come out a dark brown color that means that it has been vaporized. However if you feel like your lacking clouds of vapor lets try the following..
Make sure the herb is decent quality, more crystals, more vapor. Low quality herb does work but you need some tricks to get the most out of your herb. read on..
Make sure your herb is ground finely and packed tightly, the oven walls get hot and transfer the heat to the herb so if the herb is loose then it will not work properly. Make sure its not too tight that is will restrict airflow. Temperature settings.. at low temp settings at least 40% of vapor is near invisible. Just because you dont see 'vapor' doesn't mean that its not working. Higher temps will lead to more vapor and a dryer herb. Dryer herbs lead to better vapor quality. Do the 'light test' blow your vapor directly near a lamp or a stream of bright light. You should see the vapor clearly. Lastly, If you're a traditional smoker and you're transitioning to vaping you may find it a bit difficult in the beginning. Your body and lungs will be used to having larger 'lung filling' puffs of smoke. Vapor on the other hand is different, its more concentrated than smoke so you do not need large clouds of vapor to feel the effect. Dont give up! Many customers report that is takes at least a month to get used to vaping. Try to keep using it as a supplement to your normal habits, eventually it will be your go to device. The Crave Air mouthpiece is made from food grade silicon rubber and safe to heat up to temperature of +300°c. Although the mouthpiece should never reach uncomfortable temperatures. The mouthpiece can be cleaned by soaking in hot water to remove any residue. Alcohol wipes can be used but please do not soak the silicon rubber in alcohol as this may degrade the material. The device does not emit much odor during use, depending on the herb you are vaporizing. However you may notice a slight odor during heating or if the device is not properly cleaned. Does the device get hot? The Crave Air is compact and easily portable and the Aluminum shell is actually designed to remove heat away from sensitive components. The shell does become warm during operation, however once you hold it in your hand it will immediately start to cool as your hand will remove the heat from the shell. This is a great feature for cold days as it doubles as a hand warmer! You may notice the device is hotter when not held in your hand, this is normal. Once you pick it up it will begin to cool. 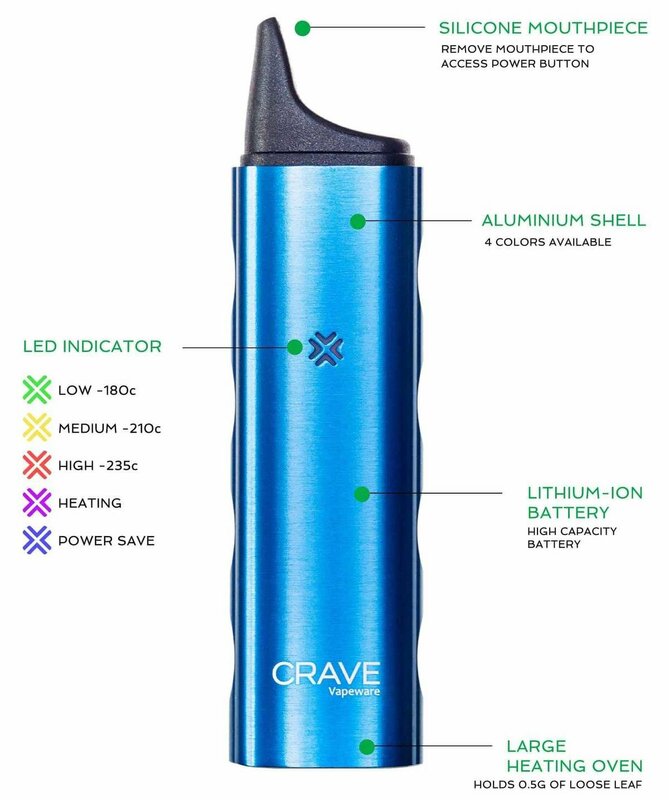 Crave Air has built-in long lasting 9V 3000mAh lithium-ion battery, once fully charged it should last about 2hrs of continuous use. This equates to about 6 full sessions each consisting of about 10-15 puffs per session. The Crave Air is sold with a 1 year guaranteed replacement warranty. It is highly unlikely, but if the device should fail during this period due to normal use we will replace it. No questions asked.